This season has left me… uninspired. False starts, irritable visitors and sunny days has meant my gaze has been focused eastward, towards the coast. While I have had some great resort days, the Backcountry this year has been frustrating. The days I have managed to get out there I have encountered poor weather with even poorer snow, but great company. A windy day out on Guthega Trig with Rohan and Mark. Windy transition, Mark is Mr Slow! A wet day touring on Mount Tate with Damian and Dave. I had borrowed Holly's lovely Lumix camera, unfortunately, these are its last photos. 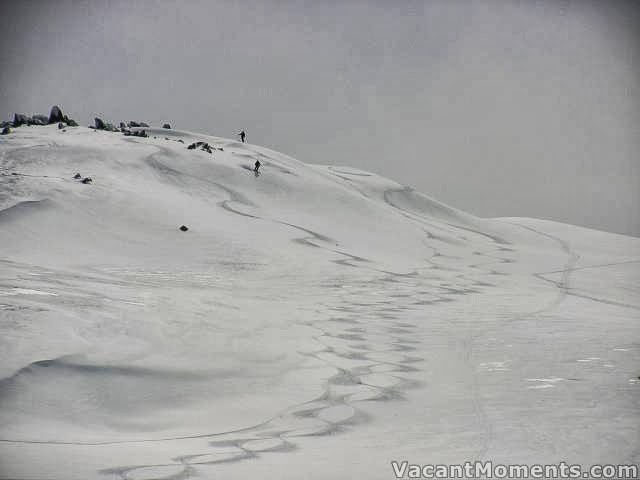 And finally some nice turns in the Perisher sidecountry before it turned to slop with Belly. Not to be too negative, its always great to get out in the BC with good friends and sometimes the turns are secondary to the funny things that happen and the conversation. Anyway, contrast this with the surf! So when my buddy Peter, aka Fast Rimey, made the trek up from the Melbourne for some BC action I was a tad apprehensive. I had just returned from another trip to the coast and scored some great waves and was considering a day relaxing at home. Nevertheless, we arranged to meet in Jindabyne and drove up to Thredbo. At the Thredbo base there is no snow, however, the liftys gave us the heads up that there was snow at the top so we clicked in for the ride up. They were right, there was plenty of snow at the top, and with a dusting of fresh, it actually looked pretty good. So good in fact, we did a few runs on the Basin, the only lift still spinning for skiing at Thredbo. The time came to hit the BC and we made our exit from the Basin top station. 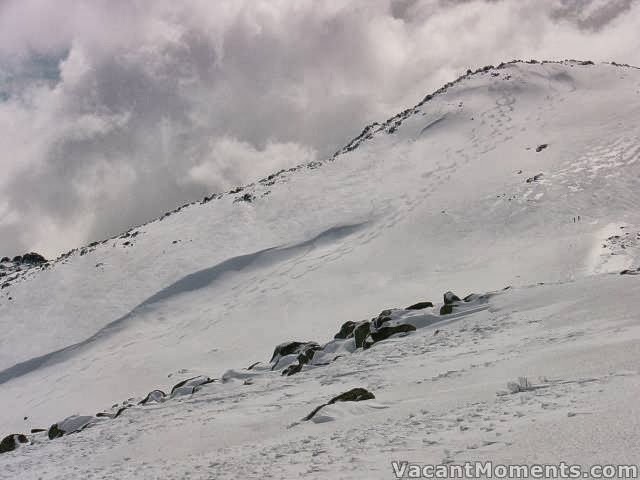 Our destination was the southern ridge of Mount Kosciuszko, terrain I had scoped out earlier in the season. We skied out along the base of Signature Hill and came around the northern Ramshead. It was here we encountered our first of a few interesting backcountry travellers for the day. A group on Nordic skiers (the ski style, not the region!) having a tilt at the Aussie 10, the ten highest peaks in Oz. They were really pushing it and managed a quick hello as they shuffled past. We topped out at the ridge and got a great view to the west. We could clearly see the Victorian high country and the terrain we were heading to looked tasty. We did a terrible run down the western face of the Ramshead through horrible wind affected ice to Cootapatamba Creek. From the creek we transitioned and worked our way up the south east face of Kosci. As we approached the top, a fellow skier dropped in and got some nice turns back to the creek letting out a few hoots, the snow looked great. 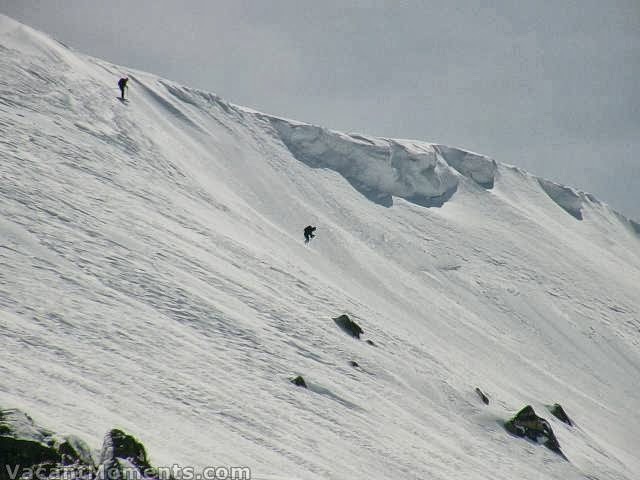 We had a quick drink at the top took some photos then skied over to a steeper face we had been eyeing off. The drop in was a little intimidating, steeper than anything I had skied for awhile. There was some lingering ice beneath the fresh but I got into a rhythm and enjoyed my run down. Stoked with our first run, we hit the trail and made it back to the top relatively quickly catching up to the lone skier we had watched drop in before and also a snowboarder booting up. We had a quick chat then hit it in fairly quick succession. The run was mellower, but way longer. We had a bite to eat with our fellow BC travellers. The skier ended up being Richard from Richards Report, a buddy of my ski bum father. While enjoying the food hit and sunshine we noticed two hikers approaching. Obviously lost, they asked us how to get back to Thredbo. They were heading towards Leather Barrel Creek and I would hate to think where they would have ended up if we weren't around to get them back on track. Richard and the snowboarder started their climb back towards Thredbo but Pete and I were keen for one more. As we got back into climbing mode a large group of ladies skied down from the Ramshead being guided by K7. We gave a quick g’day then started our climb. About half way up it was evident that the ladies were pretty fit, they were starting to reel us in. I managed to hold them off but Rimey, stopping for a drink had them nipping at his heels for the last 50 metres or so. We had a chat to the group and took some photos for them. A couple of the ladies were keen to have a look at the face we had skied for our first run so Pete and I guided them over to the intimidating drop in. Not everyone was up for it but one of the girls, Melissa was keen to have a crack. I dropped in first then took some photos of Pete and Melissa coming down. As per the first run, there was some ice beneath the fresh at the top followed by beautiful dry fresh snow lower down. We met back up with the rest of the girls who had skied a nice looking line similar to our second run. We transitioned then had a pretty easy climb and ski back to Thredbo finishing with some bonus turns to the lift and a delicious beer at the River Inn. It ended up being a fantastic day out in the mountains, perhaps my best BC day for the season. I'm reinvigorated and ready for a few more, 2013 isn't over yet!